Hi guys! I recently cleaned up my blog so this will be my first post. Description: This milky lotion-type tint with a moisturizing film made of milk and natural berry extracts, gently protects the lips without the dryness or smudging while making them appear attractive as if tinged with flower pigments. 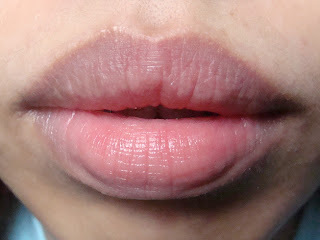 It's best applied with bare lips, no balm or gloss whatsoever and apply evenly then let it set for about a few seconds. You can layer it if you want a stronger tinge of color. This is also long lasting :) about 4-5 hours of wear maybe even longer and of course with lip tints like this you need to put lip balm on top or lip gloss, if you want you can also put some moisturizing sheer lipstick if you want more color. This is perfect for girls who want a natural hue on their lips, i'm not yet sure how it looks with girls who have pigmented/dark lips though i consider myself having dark lip lines but this tint is heaven sent since it doesn't accentuate those lines.